The UMP dirt track race car makes its debut at Modified Mania in St. Louis. The open-wheel Modified receives a high-compression, high-revving Chevy small block. AFCO Racing Conventional Master Cylinders 1"
AFCO Racing Conventional Master Cylinders 3/4"
AFCO Racing Conventional Master Cylinders 7/8"
(NARRATOR)>> IN JUST THE LAST YEAR HIS CARS HAVE WON OVER 200 DIRT TRACK RACES, AND NOW HE'S BROUGHT ONE OF HIS DESIGNS INTO OUR SHOP TO BUILD A WICKED UMP MODIFIED. TODAY ON ENGINE POWER DON JUMPER GIVES US THE INSIDE SCOOP ON BUILDING A WINNING RACE CAR. (MIKE)>> TODAY ON ENGINE POWER WE'RE CELEBRATING THE SUCCESS OF A COMPANY THAT HAS PLAYED A MAJOR ROLE IN THE PERFORMANCE INDUSTRY. WE'VE BEEN FORTUNATE ENOUGH TO HAVE A PARTNERSHIP WITH THEM FOR QUITE SOME TIME. THEY'RE CELEBRATING THEIR 50TH YEAR IN BUSINESS, AND THEY GAVE US THE GREEN LIGHT TO HELP START THAT CELEBRATION BY BUILDING A RACE CAR THAT CATERS TO THE GRASS ROOTS RACERS. THE SAME ONES THAT HELPED MAKE THEM SO SUCCESSFUL. (PAT)>> THE COMPANY IS SUMMIT RACING EQUIPMENT. YOUR SOURCE FOR ALL OF YOUR HIGH PERFORMANCE PARTS. WHETHER IT'S FOR CIRCLE TRACK, DRAG RACING, ROAD RACING, OR OF COURSE HIGH PERFORMANCE STREET VEHICLES. FOR THEIR 50TH ANNIVERSARY WE'RE GONNA BE BUILDING A CIRCLE TRACK CAR THAT FALLS INTO ONE OF THE MOST EXCITING CATEGORIES TO WATCH AT THE DIRT TRACK. A UMP OPEN WHEEL MODIFIED. 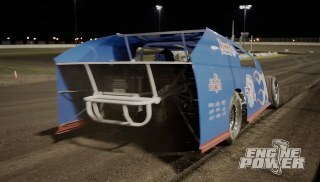 (MIKE)>> UMP MODIFIEDS HAVE BEEN A STAPLE FEATURE FOR ACTION PACKED RACING ON DIRT TRACKS. THESE CARS RUN AN EIGHT INCH WIDE TIRE AND THEY WEIGH 2,400 POUNDS WITH THE DRIVER. YOU CAN RUN A WIDE VARIETY OF ENGINES, FROM A GM CRATE ENGINE TO A BUILT BULLET THAT MAKES NORTH OF 700 HORSEPOWER. ON A THREEEIGHTHS MILE TRACK THEY CAN APPROACH 100 MILES PER HOUR ON THE STRAIGHT AWAYS, WHICH IS IMPRESSIVE. (PAT)>> EVERY PART OF A UMP MODIFIED PLAYS ITS OWN ROLE IN MAKING A WINNING CAR, AND THE CHASSIS IS THE CENTER PIECE OF THE WHOLE DEAL. NOW IT HAS TO BE ENGINEERED WITH PRECISION FOR PROPER SUSPENSION GEOMETRY, STRENGTH, AND MOST IMPORTANT THE SAFETY OF THE DRIVER, AND HELPING US OUT THIS WEEK IS DON JUMPER OF IMPRESSIVE RACE CARS. NOW DON TELL ME HOW YOU GOT STARTED BUILDING RACE CARS. (DON)>> WELL BACK WHEN I USED TO RACE MYSELF I RAN INTO A LOT OF STUFF AND COULDN'T AFFORD TO HAVE ANYBODY FIX IT FOR ME. SO WE STARTED FIXING IT OUR SELF, AND 30 YEARS LATER HERE WE ARE. (PAT)>> AND YOUR CARS ARE VERY SUCCESSFUL. YOU'VE GOT A LOT OF WINNING CARS. TELL ME ABOUT SOME OF THE CHAMPIONSHIPS. (DON)>> WE WON THE UMP MANUFACTURERS CHAMPIONSHIP LAST SIX YEARS IN A ROW. WITH OUR PRO MOD WINS, AND OUR IMCA AND USRA WINS WE WERE AROUND 220 FEATURE WINS FOR 2017. (PAT)>> NOW HOW MANY OF THOSE CARS HAVE TO COME BACK WHEN THEY GET BANGED UP? (DON)>> I NEVER REALLY FIGURED OUT THE PERCENTAGE. WE PROBABLY WORK ON 20 PERCENT OF WHAT WE DO PROBABLY COMES BACK AT ONE TIME OR ANOTHER. (PAT)>> NOW DO YOU GO TO THE TRACK FOR SUPPORT ON SOME OF THESE? (DON)>> OH I'M AT THE RACE TRACK TWO, THREE NIGHTS A WEEK, YES. (PAT)>> NOW WHAT DOES THIS MEAN FOR YOU TO BE PART OF THIS 50TH ANNIVERSARY BUILD? (DON)>> THE PEOPLE AT SUMMIT CONTACTED ME, AND I WAS VERY HONORED, AND I FEEL VERY FORTUNATE TO BE ASSOCIATED WITH ALL YOU GUYS. (PAT)>> TELL ME A LITTLE BIT ABOUT THE PROCESS OF BUILDING ONE OF THESE CARS. (DON)>> IT STARTS OUT WITH THE FRONT CLIP AND IT IS AN AFTERMARKET REPLICA OF A '68 TO '72 CHEVELLE. IT COMES FROM AFCO RACING PRODUCTS. VERY, VERY NICE QUALITY PIECE. THE REST OF THE PIPES WE DO ALL THAT OURSELVES. ALL THE STRAIGHT PIPES ARE LASER CUT. SO THEY'RE ALL EXACTLY ALIKE, BUT WE DO ALL THE BENT PIPES OUR SELF. (PAT)>> NOW THERE ARE, OBVIOUSLY, A BUNCH OF HARD RULES, BUT WHAT CAN YOU DO WITH YOUR OWN DISCRETION ON THE CHASSIS AND HOW YOU WILL MAKE IT WORK FOR YOU? (DON)>> THERE ARE A LOT OF RULES LIKE WHEEL BASE, TRACK WIDTH, HEIGHT, BODY RULES, THINGS LIKE THAT, AND WE TRY TO STAY WITHIN THOSE RULES BUT TRY TO MAX IT OUT AS MUCH AS POSSIBLE WITHOUT GETTING INTO THE GRAY AREA. (PAT)>> IF IT'S NOT A GRAY AREA YOU'RE NOT RACING. (DON)>> WELL YEAH, BUT I CAN'T REALLY BUILD 40 OR 50 CARS A YEAR AND HAVE SOMETHING THAT'S OUT OF THE GRAY AREA AND THEN I HAVE TO FIX EVERYTHING CAUSE I'VE ALREADY BEEN THERE AND DONE THAT. (PAT)>> OKAY, VERY GOOD. NOW THIS AFCO FRAME KIT, IT'S A NICE PIECE. DOES IT COME WITH THE PLATES ON IT LIKE THIS ALREADY OR DO YOU HAVE TO DO ALL THAT STUFF YOURSELF? (DON)>> NO IT COMES IN 10 PIECES IN A CARDBOARD BOX. THE UPPER "A" FRAME MOUNTS, ALL THESE PLATES. THAT IS ALL OUR DEAL. (PAT)>> THIS IS A LITTLE BIT OF A TIME SAVER. (DON)>> OH, WHEN AFCO CAME OUT WITH THIS CLIP IT TOOK EIGHT HOURS OFF OF BUILDING THE CAR. WE MADE THE DRIVER'S COMPARTMENT, OR ACTUALLY THE "A" POST TO THE MAIN HOOP, A LITTLE BIT SMALLER BECAUSE IT MADE IT A LOT STRONGER. IF YOU SPREAD IT OUT IT GETS WEAKER. YOU GET SMALLER, YOU GET STRONGER. (PAT)>> AND THE REAR END, THIS THING LOOKS LIKE IT'S SOMETHING OUT OF A SPACE SHUTTLE HERE. (DON)>> IT'S GOT A LOT OF SHINY LOOKING PARTS ON IT. IT IS A QUICK CHANGE REAR END FROM PEM MANUFACTURING. I HAS BSP BIRD CAGES ON IT. THE TRAILING ARMS AND ALL THAT CAME FROM ALL STAR. ALL BASIC STUFF TO US BUT NOT BASIC TO THE NORMAL PERSON. (PAT)>> IT LOOKS PRETTY HIGH TECH. (MIKE)>> AND THERE'S PLENTY OF HIGH TECH PARTS TO GO ON THIS CHASSIS. SO WE NEED TO GET STARTED, AND IT BEGINS WITH THE PANELS FOR THE DRIVER'S COMPARTMENT. BENDING THESE PANELS IS AS MUCH ART AS IT IS SCIENCE. EVERYTHING HAS TO FIT JUST RIGHT OR IT WILL BE NOTICED. WE INSTALLED THE SHIFTER AND THE IGNITION SWITCH PANEL BEFORE THEY WENT IN. WITH THESE FOUR PANELS LAID IN PLACE, WE CAN START RIVETING THEM TOGETHER AND TO THE CHASSIS. I HAVE TO GIVE A SHOUT OUT TO MATCO FOR SUPPLYING US WITH THIS AIR POWERED RIVET GUN. IT MAKES THIS WORK MUCH EASIER. THE GAUGES, THROTTLE PEDAL ASSEMBLY, AND SOME WIRING ARE ALL GOING INTO THEIR RESPECTIVE PLACES. NOW THE COLLAPSIBLE STEERING SHAFT CAN SLIDE IN, FOLLOWED BY THIS AFCO PEDAL ASSEMBLY. THE BRAKE LINES ATTACH TO BULKHEAD FITTINGS PLACED IN THE PANELS. AN MSD IGNITION SYSTEM IS PLACE ABOVE THE PEDAL ASSEMBLY. THIS LOCATION WILL KEEP IT SAFE FROM THE ELEMENTS AND DAMAGE FROM A CRASH. (PAT)>> WITH THE DRIVER'S COMPARTMENT BUTTONED UP WE ARE WELL ON OUR WAY TO BUILDING A COMPETITIVE UMP CAR. A CAR THAT HONORS 50 YEARS OF SUMMIT RACING EQUIPMENT. (NAN)>> THIS IS THE MILESTONE ONE, NUMBER 50. A LOT OF BUSINESSES DON'T EVEN GET THERE BUT WE HAVE NOT ONLY GOTTEN THERE BUT WE'RE GROWING. SO WE'RE INTO A LOT OF NEW CATEGORIES INCLUDING CIRCLE TRACK, AND WE'RE SAYING THAT WE HAVE EVERYTHING YOU NEED FOR ANYTHING YOU DRIVE, AND THAT'S MORE TRUE THAT ITS' EVER BEEN. (NARRATOR)>> JUST AHEAD, THE MODIFIED GETS HIGH PERFORMANCE FRONT SUSPENSION AND A WICKED REAR END. (MIKE)>> DON WE GOT A LOT OF THE DRIVER'S COMPARTMENT WRAPPED UP. TELL ME WHAT SOME OF THESE THINGS DO FOR GUYS THAT ARE WATCHING THAT HAVEN'T REALLY SEEN DIRT CARS. (DON)>> WE'VE INSTALLED THE GAUGE PANEL, WHICH HAS FOUR GAUGES. AN OIL PRESSURE, WATER TEMPERATURE, FUEL PRESSURE, DIGITAL TACH. WE GOT THE IGNITION SWITCH PANEL IN, WHICH IS THE ON AND OFF, AND THE STARTER BUTTON. WE PUT THE SHIFTER IN. WE'VE GOT A BRAKE BIAS ADJUSTOR FOR THE FRONT AND REAR BRAKES. WE'VE GOT A COLLAPSIBLE STEERING SHAFT IN, WHICH IS A SAFETY ITEM IN CASE YOU'RE IN AN ACCIDENT. WE'VE GOT THE IGNITION BOX AND THE COIL. GOT THE BRAKE PEDALS AND THE INTERIOR BRAKE LINES, AND THE INTERIOR WIRING IS DONE. (MIKE)>> AT WHAT POINT IS THE DRIVER REALLY MAKING ADJUSTMENTS ON THAT BIAS? (DON)>> CHANGING TRACK CONDITIONS. WHEN THE TRACK STARTS GETTING SLICKER AS THE NIGHT GOES ON THEY MIGHT TAKE SOME REAR BRAKE OUT OR PUT SOME REAR BRAKE IN DEPENDING ON WHAT THEIR CAR WAS DOING. (MIKE)>> AND THEN ANOTHER BIG THING, LIKE YOU WERE SAYING, WITH THE SAFETY FEATURE WITH THE COLLAPSIBLE COLUMN. WHEN DOES THAT REALLY COME INTO ISSUE? (DON)>> WELL IF YOU RUN INTO SOMETHING HEAD ON AT A HIGH SPEED THE STEERING SHAFT HAS THE CAPABILITY OF COMING BACK AND THE STEERING WHEEL HITTING THE DRIVER IN THE CHEST. WITH THE COLLAPSIBLE COLUMN THAT WON'T HAPPEN. IT SLIDES TOGETHER. (DON)>> IT IS A MUST HAVE. (MIKE)>> ALL RIGHT, NOW WE'VE GOT MOST OF THE COCKPIT DONE. YOU WANTED TO HOLD OFF ON PANELS FOR THIS AND MOVE TO A DIFFERENT AREA OF THE CAR. WHERE DO YOU WANT TO HEAD? (DON)>> FRONT SUSPENSION. WE CAN FINISH THE STEERING SHAFT UP THEN. (MIKE)>> THE STEERING BOX IS FROM SWEET MANUFACTURING. IT HAS A SIX TO ONE RATIO AND A 185 THOUSANDTHS VALVE. A BILLET PITMAN ARM IS USED DUE TO THE ABUSE IT SEES. (PAT)>> NICE WHEN EVERYTHING FITS THE WAY IT'S SUPPOSED TO ISN'T IT? (MIKE)>> THIS SHAFT WAS MADE IN HOUSE AT IMPRESSIVE RACE CARS. IT ATTACHES TO THE SPLINES OF THE COLLAPSIBLE SHAFT GOING INTO THE DRIVER'S COMPARTMENT. A HEIM JOINT SUPPORTS IT TO THE CHASSIS. NOW WE'RE INSTALLING THE LOWER CONTROL ARM. ALL GRADE EIGHT HARDWARE IS USED. WHEN TIGHTENING THE CONTROL ARM IT NEEDS TO HAVE SOME FREE MOVEMENT WITH NO BINDING. PAT IS GETTING IT DIALED IN. (DON)>> IF IT FALLS DOWN ON ITS OWN AND FEELS FREE YOU'RE GOOD. (MIKE)>> UP NEXT IS THE UPPER CONTROL ARM AND SPINDLE ASSEMBLY. WE HAD IT ALL MOCKED UP, MAKING FOR AN EASY FINAL BOLT TOGETHER. (PAT)>> AN FITTINGS ARE USED FOR ALL THE BRAKE LINES. A STANDARD AT IMPRESSIVE RACE CARS. NOW THE IDLER ARM AND DRAG LINK ARE BOLTED TO THE CHASSIS. THE FRONT SPRINGS GO IN NEXT. A SPRING CUP IS USED AND HAS A JACK BOLT THAT THREADS THROUGH THE FRAME INTO THE CUP. AFCO SHOCKS ARE BEING USED ON THIS BUILD. SPEC'D BY DON JUMPER, THEY WILL BE A GREAT MATCH FOR THIS OPEN WHEEL. THE OTHER SIDE GOES TOGETHER THE SAME WAY. ALL THESE COMPONENTS ARE DESIGNED FOR EXTREME USE IN DIRT TRACK RACING. THEY WILL SEE ABUSE AND DEFINITELY BE EXPOSED TO THE ELEMENTS. WELL LIKE EVERYTHING ELSE THAT'S BEEN GOING ON THIS CAR, IT WENT TOGETHER SUPER SMOOTH AND THIS IS STUFF I'M ACTUALLY A LITTLE BIT MORE FAMILIAR WITH BECAUSE IT'S TUBE "A" ARM SUSPENSION. TELL ME WHAT THE THEORY IS BEHIND WHAT YOU'RE USING. (DON)>> THE UPPER CONTROL ARMS WE GET MADE FOR US BECAUSE EVERYBODY CAN DO THEIR OWN THING ON THEIR UPPER CONTROL ARM MOUNTS. WE HAVE THOSE MADE FOR US. SO THEY WORK OUT WELL. IT'S GOT A HEIM JOINT ON THE FRONT SIDE THAT GOES INTO THE SOLID TUBE SO YOU CAN ADJUST YOUR CAMBER EASILY. THE BACK SIDE'S GOT A LEFT AND RIGHT TUBE ON IT. SO YOU CAN ADJUST THE CASTOR EASILY. THAT WAY YOU DON'T HAVE TO TAKE EVERYTHING APART EVERY TIME YOU WANT TO ADJUST THE FRONT END. WE'VE GOT ALL STAR LOWER CONTROL ARMS ON IT. THEY WORK OUT REALLY WELL. IT'S GOT A WEHRS JACK BOLT WHICH HAS A MONO BALL IN THE TOP OF IT. SO IT TAKES ALL THE BIND OUT WHEN THE THING'S GOING THROUGH TRAVEL. WE'VE GOT AN AFCO 74 SERIES SCHRADER VALVE SHOCK. (PAT)>> EXPLAIN TO ME A LITTLE BIT WHY YOU HAVE SO MUCH ADJUSTMENT, LIKE WITH THE JACK BOLTS AND THE CASTOR/CAMBER BECAUSE YOU GUYS, DEPENDING ON THE TRACK, YOU ACTUALLY ADJUST A LOT OF THAT AS PER THE TRACK'S CONDITIONS. (DON)>> YES, DEPENDING ON WHERE YOU'RE AT AND WHAT YOU'RE DOING. THE JACK BOLT ADJUSTS YOUR RIDE HEIGHT AND WHEEL WEIGHT PER CORNER. SO YOU CAN MOVE EVERYTHING AROUND A LOT WITH ALL THAT. LIKE A BIGGER RACE TRACK MIGHT TAKE A DIFFERENT CAMBER AND CASTOR NUMBER THAN A SHORT TRACK WILL. SO YOU'VE GOT ROOM TO ADJUST ON THAT. (PAT)>> THERE'S SOME BILLET PARTS ON THERE WITH A STEERING BOX, IS A TRICK LOOKING PIECE. ALL OF YOUR DRAG LINK, EVERYTHING'S OBVIOUSLY PURPOSE BUILT AND IT LOOKS GREAT AND FITS GREAT. (NARRATOR)>> UP NEXT, HEAVY DUTY REAR SUSPENSION PROVIDES GREAT PERFORMANCE AND EASY ADJUSTABILITY AT THE TRACK. (MIKE)>> WE'RE BACK ON ENGINE POWER AND YOU PROBABLY GUESSED IT. WE'RE HEADING TO THE REAR TO GET MORE SUSPENSION ON THE CAR. DON'S ATTACHING THE LOWER CONTROL ARM TO A PREDETERMINED LOCATION ON THE CHASSIS. NOTICE THE NOTCH IN THE BRACKET? THAT INDICATES THE HOLE USED FOR THIS SETUP. WITH PIT MAN PAT RUNNING THE JACK UNDER THE PEM QUICK CHANGE, THE UPPER ARMS ARE ATTACHED AND HAVE THE SAME NOTCHES FOR THE CORRECT LOCATIONS. DON'S ALSO INSTALLING THE "J" BAR CHASSIS MOUNT. IT'S THE ATTACHMENT POINT FOR THE "J" BAR, WHICH KEEPS THE REAR END CENTERED. IT HAS A SPECIFIC HEIGHT LOCATION, WHICH IS BEING MEASURED. AFTER BEING TIGHTENED, THE "J" BAR ATTACHES TO IT. THERE'S NO DENYING WHERE THE BAR GOT ITS NAME. (PAT)>> THE PULL BAR GOES IN NEXT. ITS JOB IS TO REDISTRIBUTE LOAD DURING ACCELERATION OR DECEL TO HELP CONTROL TRACTION. YEP! (MIKE)>> DON AT THE REAR SUSPENSION THERE'S A LOT GOING ON, OR AS YOU SAID, IT LOOKS REALLY BUSY. LET'S START OFF BY GIVING A LITTLE EXPLANATION OF ALL THE DIFFERENT COMPONENTS. YOU WANT TO START ON YOUR SIDE WITH THE BIRD CAGES? (DON)>> THE BIRD CAGE, IT BASICALLY HOLDS THE REAR END IN PLACE. IT'S GOT SOME INNER BEARINGS THAT ARE SEALED. THAT'S SOMETHING THAT HAPPENED A FEW YEARS AGO WITH THIS BECAUSE IT CUT DOWN ON THE MAINTENANCE ON THE REAR SUSPENSION QUITE A BIT. DON'T HAVE TO GREASE AND CLEAN THEM AS MUCH AS WE USED TO. WE'VE GOT FOUR TRAILING ARMS, TWO ON EACH SIDE. THEY ADJUST THE WHEEL BASE AND ALSO THE INDEX OF THIS BIRD CAGE. HOW MUCH IT'S TURNED INTO THE SPRING WHEN IT'S SITTING AT RIDE HEIGHT CAUSE THAT'S A VERY IMPORTANT PART. (MIKE)>> HOW MUCH DOES THE AXLE ACTUALLY ROLL FORWARD AND BACK, UP AND DOWN WHEN IT'S OUT ON THE TRACK? (DON)>> LIKE THE LEFT SIDE, IT MORE ROCKS UP. WHEN YOU'RE ON THE THROTTLE THE LEFT REAR RAISES UP, AND IT RAISES UP ABOUT FOUR, FOUR AND A HALF INCHES. THE REAR END STEERS FORWARD PROBABLY THREE INCHES WHEN IT DOES THAT. WHEN IT RAISES UP WITH THE DYNAMICS OF THE BIRD CAGE IT LOADS THIS SPRING, WHICH MAKES TRACTION BUT IT HAS TO ROLL IT FORWARD TO KEEP THE CAR TURNING WHEN ALL THAT'S HAPPENING. OTHERWISE IT TRIES TO MAKE A RIGHT HAND TURN. SO IT ALL HAS TO WORK TOGETHER IN SYNC TO MAKE IT ALL WORK. THAT SIDE'S MORE STATIONARY. IT DOESN'T STEER AS MUCH AS THIS SIDE. THE SPRING'S IN THE FRONT, SO THE DYNAMICS ARE BACKWARDS. THAT SIDE'S ROLLING OVER, GETTING CLOSER TO THE GROUND. AS YOU GO INTO CORNERS, THIS ONE'S RAISING UP. SO EVERYTHING'S THE OPPOSITE. (MIKE)>> BIG SPRING AND EVERYTHING UP ON THE PULL BAR. WHAT'S IT'S JOB? (DON)>> THIS IS A STRAIGHT UP 1,200 POUND SPRING. WHAT IT DOES IS WHEN YOU THROTTLE THIS CAR UP THE REAR END ROLLS BACK BY NATURAL MOVEMENT. DEPENDING ON HOW LONG THAT PULL BAR IS AND HOW MUCH ANGLE YOU HAVE IN IT, HOW FAR OFF THE CENTER OF THE REAR AXLE IT IS. ALL THAT HAS TO DO WITH HOW MUCH TRACTION THIS CAR GETS. (DON)>> "J" BAR HAS EVERYTHING TO DO WITH HOW THE CAR ENTERS THE CORNER TO THE CENTER OF THE CORNER. HOW FAST THE CAR ROLLS OVER ON THE RIGHT REAR TIRE. HOW MUCH IT ROLLS OVER ON THE RIGHT REAR TIRE. (MIKE)>> THAT BASICALLY, THE "J" BAR, ALSO KEEPS THE REAR END CENTERED LIKE A PAN HARD BAR. (DON)>> IT'S THE SAME THING AS A PAN HARD BAR. IT KEEPS IT CENTERED. (MIKE)>> QUICK CHANGE REAR END? (DON)>> IF YOU GO FROM RACE TRACK, TO RACE TRACK, TO RACE TRACK YOU HAVE TO HAVE ALL THESE DIFFERENT GEAR CHUNKS TO PUT IN THE FRONT OF IT. FOR CHANGING TRACK CONDITIONS. YOU CAN CHANGE THE GEAR RATIO IN LIKE FIVE MINUTES. (PAT)>> THE BRAKE LINES ARE HANDLED NEXT. IMPRESSIVE RACE CARS WELDS ALL THE NECESSARY TABS IN THE PLACES THEY NEED TO BE. A RACE CAR ALSO NEEDS 12 VOLT POWER. THIS OPTIMA RED TOP BATTERY WILL GIVE IT PLENTY. A SIMPLE PIECE OF ANGLE AND THREADED ROD HOLDS IT IN PLACE JUST RIGHT. NEXT IS AN IMPORTANT PIECE NOT ONLY TO SUPPLY THE CAR WITH FUEL, BUT ALSO PROTECT THE DRIVER. IT'S A FUEL CELL FROM PYROTECH. IT HAS AN INNER BLADDER TO ELIMINATE THE CHANCE OF FUEL SPILLS IN CASE THE OUTER SHELL IS DAMAGED. A SUPER STRONG STEEL STRUCTURE WILL SECURE IT TO THE CHASSIS. (MIKE)>> DON WE SHOWED THE BRAKE ASSEMBLY, AND THE PEDALS, AND THE ADJUSTOR GOING IN. THERE'S THREE RESERVOIRS. TELL ME WHAT'S ALL GOING ON THERE. (DON)>> WE'VE GOT ONE MASTER CYLINDER FOR THE CLUTCH AND TWO MASTER CYLINDERS FOR THE BRAKE. ON GOES TO THE FRONT, ONE GOES TO THE REAR. YOU CAN GET DIFFERENT SIZE MASTER CYLINDER BORES FOR THAT TO MAKE DIFFERENT PRESSURE DEALS, DEPENDING ON WHAT YOU WANT TO DO WITH YOUR BRAKE BIAS. (MIKE)>> NOW COMING OUT TO THE FRONT WE HAVE ONE LINE THAT SPLINTS OFF TO BOTH FRONTS, AND THEN OVER HERE YOU'VE GOT A FUNNY LOOKING SOLENOID. (DON)>> YEAH DEPENDING ON WHAT RACING ORGANIZATION OR SANCTIONING BODY YOU'RE RACING WITH. SOME PEOPLE WILL LET YOU HAVE A RIGHT FRONT BRAKE SHUT OFF, SOME OF THEM WON'T. WITH UMP THEY DON'T REALLY MIND. SO A LOT OF GUYS HAVE GOT THEM. WHEN THE RACE TRACK IS REALLY HOOKED UP WIDE OPEN SITUATION YOU CAN SHUT THE RIGHT FRONT BRAKE OFF AND HELP YOUR CAR TURN. (MIKE)>> BASICALLY APPLYING THE LOAD TO THE LEFT FRONT, PULLING IT INTO THE CORNER? (MIKE)>> VERY COOL, THAT'S A NEAT SETUP. (NARRATOR)>> UP NEXT, EVERYTHING WE NEED TO MAKE THIS RACE CAR LOOK LIKE A RACE CAR. (PAT)>> WELCOME BACK. NOW THE REST OF THE BODY PANELS WILL GO ON. WE'LL CALL IT A PANEL PARTY. (DON)>> I THINK YOU'RE RIGHT THERE. LOOKS GOOD THERE. (PAT)>> THESE ARE ALL FABBED UP AT IMPRESSIVE RACE CARS. THE BENDING AND FITMENT IS SECOND TO NONE. THE SHEETS OF ALUMINUM WERE ORDERED IN BLUE. 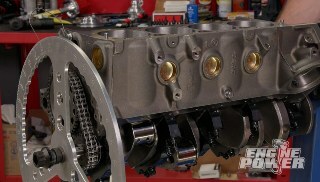 A MID PLATE IS USED TO MOUNT THE BACK OF THE ENGINE AND TRANSMISSION. IT BOLTS TO TABS ON THE CHASSIS. THE ROOF GOES ON NEXT. THIS ALLOWS YOU TO REALLY START SEEING WHAT THE CAR WILL LOOK LIKE. THE PASSENGER SIDE PANEL IS FAIRLY LARGE. ALONG WITH THE RIVETS, THERE ARE ALSO ALUMINUM STRAPS USED TO SECURE IT TO THE CAR. RUB RAILS GO IN BEHIND THE PANEL. THESE KEEP THE PANEL FROM BEING TOO DAMAGED WHEN CONTACT IS MADE ON THE TRACK. THE DRIVER'S SIDE GOES ON THE SAME WAY. NOW THE HOOD GOES ON. REGULAR OLD HOOD PINS ALLOW FOR FAST REMOVAL. WELL THIS IS AWESOME LOOKING. (MIKE)>> IT'S AMAZING WHAT THE PANELS DO TO THE CAR. (PAT)>> YEAH, EVERYTHING FIT LIKE IT SHOULD AND THAT'S JUST CAUSE A MAN KNOWS HOW TO DO HIS WORK, YOU KNOW WHAT I'M SAYING? (MIKE)>> QUALITY IS SECOND TO NONE, I'VE GOT TO SAY THAT. COLOR SCHEME, PERFECT! RED, WHITE, AND BLUE! CHASSIS WILL SHOW ANY LEAKS OR ANYTHING GOING ON THERE. DO THE ENGINE THE SAME WAY. (PAT)>> WELL YOU CAN TELL ONE OF THE REASONS WHY THIS THING WENT TOGETHER EASY IS I SEE A 516 ON THE FRAME. THIS IS YOUR 516TH CAR? (PAT)>> WELL OBVIOUSLY YOU'VE GOT IT SCIENCED OUT. THAT'S A TRUE TESTAMENT TO THE CRAFTSMANSHIP, AND THE QUALITY, AND THE DESIGN, AND EVERYTHING THAT YOU DO THERE. MAN WE REALLY WANT TO THANK YOU CAUSE YOU'RE A BIG HELP HERE. (MIKE)>> WHAT NUMBER DO YOU THINK THAT'S GONNA BE AT AT THE END OF THE YEAR, COME DECEMBER? (PAT)>> YOU KNOW WHAT DOESN'T LOOK BIG TO ME IS THE WINDOW OPENING. I WAS MEASURING THAT, I WAS MEASURING THIS, AND I WAS MEASURING THIS. (PAT)>> I DON'T KNOW IF I CAN GET IN IT. I'D HAVE TO SLIDE IN FEET FIRST. YOU'D HAVE TO PUSH ME INTO THE BACK AND I'LL DUMP INTO THE SEAT. (MIKE)>> WE HAD A LAST MINUTE DELIVERY. LUCKY FOR US IT'S A VERY IMPORTANT PART OF THE CAR. IT'S A FULL CONTAINMENT ALUMINUM RACING SEAT FROM KIRKEY DESIGNED TO ACCOMMODATE ALL NECK AND HEAD RESTRAINT SYSTEMS. IT'S ALSO DESIGNED FOR EASY ENTRY AND EXIT INTO YOUR RACE CAR. LET'S SEE HOW THAT GOES. (DON)>> PAT YOU'RE ON IT. (MIKE)>> YOU'RE ON, YOU'RE IN, YOU'RE UP! (PAT)>> I MEAN DO YOU HAVE SOME WD 40? I CAN'T GET MY LEG UP THERE. (MIKE)>> THERE YOU GO, SEE? UH OH, UH OH, HANG ON, FLASHLIGHT. (PAT)>> I GOT FLASHLIGHT, POCKET PROTECTOR. (DON)>> IT WASN'T DESIGNED FOR TOOLS. (PAT)>> LISTEN, THIS IS NOT DESIGNED FOR FULL GEAR. OUCH, OW! ALL RIGHT I'M FINE. (MIKE)>> GRAB YOUR WHITE BAR RIGHT IN FRONT OF YOUR CHIN. (PAT)>> WHO, WHAT? OUCH, OW! SEE IF YOU PUT A RADIUS ON THESE, LIKE A BIG SLIDE, AND THEN PUT LIKE SOME DELVIN RUBBING THINGS ON IT. LOOK AT THAT. AWESOME JOB! (MIKE)>> THE LAST THING TO GO ON THE CAR FOR TODAY ARE THE WRAP AND DECALS TO PAY TRIBUTE TO SUMMIT RACING FOR THEIR SUCCESS IN THE PERFORMANCE INDUSTRY OVER THESE LAST 50 YEARS. (NAN)>> IT GETS US CLOSER TO THE PEOPLE THAT GOT US TO 50 YEARS. THAT'S OUR BREAD AND BUTTER. THOSE ARE THE PEOPLE THAT HAVE ALWAYS BEEN PASSIONATE ABOUT THIS, AND INTERESTED IN IT. GRASS ROOTS MOTOR SPORTS, SPORTSMAN RACING. SO WE SPONSOR A LOT OF SPORTSMAN RACING, AND WE SPONSOR MODIFIED MANIA IN SAINT LOUIS, AND THAT'S WHERE THE CAR WILL BE AUCTIONED OFF, AND SOMEBODY HAS A CHANCE TO BUY AN INCREDIBLE COMPETITIVE CAR. (MIKE)>> FOR MORE INFORMATION ON ANYTHING YOU'VE SEE TODAY HEAD ON OVER TO POWERNATION TV DOT COM.